To be honest, I can't remember a time when I DIDN'T know about the wonder that is Maybelline Great Lash Mascara. It's one of those beauty products that's just always been part of my arsenal. And who doesn't love the iconic pink and green tube? For me, Great Lash is the mascara that all others are measured against. I'm hard pressed to find another mascara that lengthens, thickens, curls and intensifies my lashes quite like it. I pretty much always measure mascara by whether it makes my already long lashes hit my glasses -- and this one DELIVERS. Starting with my time in theater (and we're talking from the early 80s) and right up to the present day, Maybelline Great Lash Mascara has been the one I continuously revisit and repurchase. This is one product that isn't leaving my stash. Ever. For me? Maybe it's Maybelline doesn't cut it. It's DEFINITELY Maybelline. 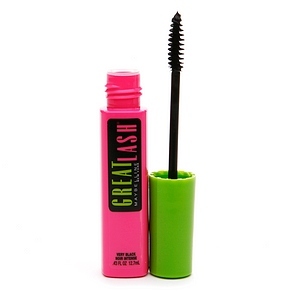 Maybelline Great Lash Mascara retails for $5.99 at drugstore.com. I haven't tried good ole' pink & green Great Last in a long time because last time I tried it, it didn't compare with the volumizers that are available these days. But with your great review, it'll go back on the list! There's just something about Great Lash that I've always loved! You'll have to let me know what you think the next time you try it. This is definitely a classic for a reason! This is really strange how for some people this is HG mascara and for others it is total nightmare. I used it very very long time ago and unfortunately I wasn´t impressed. I know, it is very polarizing. I will say that I tried Great Lash Big and HATED it -- I was allergic to it! But the regular old Great Lash has always worked wonders for me. Oh wow, you have to! I know I've used this in the past, but I don't really remember how I felt about it either way. The clear version does make brow gel though! YES! I totally need to pick up clear now. I've never tried Milani actually! Will have to. Can you believe I never tried this mascara O.o? This is my favorite mascara, no lie!!! I STILL use it and have 3 different types, waterproof, mega lash and the original!! It's the mascara my mom still uses and I've never let it go!!!! I'm right there with you! I try others but I ALWAYS come back to Great Lash.